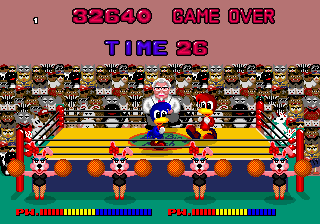 Oh boy oh boy, if there's one genre of arcade games I love talking about, it's the Scrolling Brawler genre, specifically between 1987 and 1989. Not that brawlers afterwards aren't interesting- they most certainly are- but the ones in this period are profoundly odd. 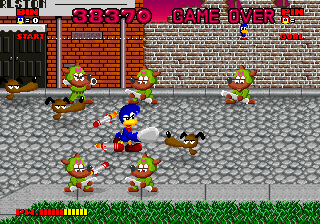 Another case to add to this pile of weird brawlers is one of the strangest around, Dynamite Düx. 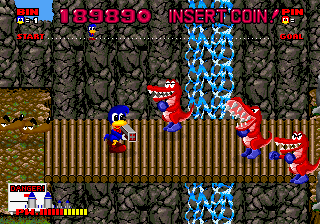 Released in 1988. before Golden Axe marked Sega's real entry into the genre from Team Shinobi, Dynamite Düx is a scrolling brawler in much the same way Taito's Pu.Li.Ru.La. is- they both have you moving both left and right and towards and away from the screen, and they definitely have you knocking seven bells out of anything that moves, but they also play fast and loose with what I suppose are the established rules of the genre. It's a little different, of course, seeing as Pu.Li.Ru.La. 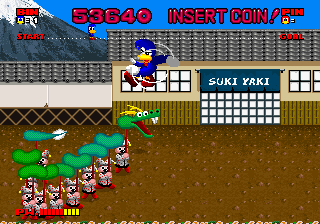 came out after the rules were established while Dynamite Düx came before, in that wild time where weird brawlers like the original Ninja Gaiden and P.O.W. - Prisoners of War were rife. As a result, you would normally say this game was ignoring the genre rulebook, but it didn't really exist just yet. 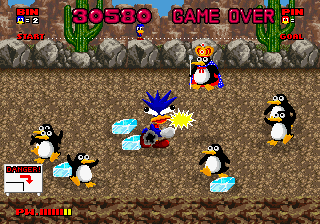 As either Bin (Player 1, blue) or Pin (Player 2, red), you must journey into the evil Achacha's world to rescue your owner, Lucy, who has been kidnapped by the self-titled Achacha the Great. This involves knocking seven bells out of anything that moves, including but not limited to bloodthirsty sausage-dogs, mortar-launching kangaroos, and rhinos in full American football gear trying to tackle you. That's not even mentioning the bosses, like a sentient storm cloud and a giant circle of fire. I told you this game was odd. Just plain ol' rocks. Thrown quite far. Explode and can take out multiple enemies. The double-bomb variant has more ammo. Rapid-fire! Very effective on bosses. Very powerful, but short range, and ammo gets consumed even when not in use. Packs a punch, and flies quickly through the air. Additionally, there's food items scattered about- small ones restore 4 health points, bigger ones restore 8. We're pretty much ready to go on this one, then! See, there's not that much to discuss mechanics-wise beforehand. It was a different era for brawlers, that's for sure. 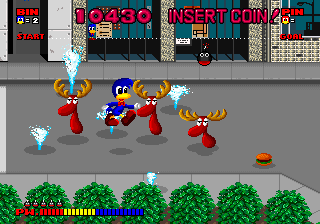 Anyway, the trip through the bizarre world of Achacha the Great consists of six different stages, so this won't be terribly long, but you'd better prepare for some of the oddest opponents in any scrolling brawler. Yes, even stranger than the Pretty Boys from The Punisher. 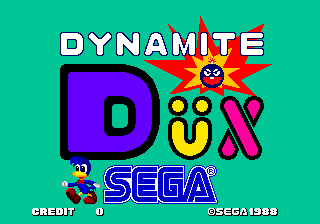 It's time to put up our dukes- let's play Dynamite Düx! Time to get lucky, ducky!